Käytä ensisijaisesti allaolevaa yhteydenottolomaketta tiedusteluihin, varauksiin ja kommentointiin. Otamme sinuun yhteyttä sähköpostitse (tai muilla toivomillasi tavoilla). ﻿ We spent a lovely week at Le Nichoir, in mid-March when weather can be almost anything. The luck was on our side: we enjoyed sun almost every day, temperatures rising to 20 degrees Celsius during daytime. Le Nichoir is situated in le Tarn, a region not so well known by tourists but worth the visit. Landscapes vary between hills and forests, fields and old villages, mountains and canyons. It is a perfect region for long walks, along small roads between the villages or well indicated walking paths. We enjoyed all of that, in addition to visiting medieval towns such as Albi. It is highly recommended to have a car, as there is so much to see. Le Nichoir is an old house renovated with excellent taste. It is a combination of a French farm and an English country house in perfect harmony. We had at our disposal a large bedroom, a bathroom with a bath and shower, as well as a large sitting room where we sat by the fireplace in the evenings. The house is surrounded by a huge garden the size of three football fields, with a swimming pool and a pond where we could hear the amazing frogs of southern France that sound like a motorway at times. 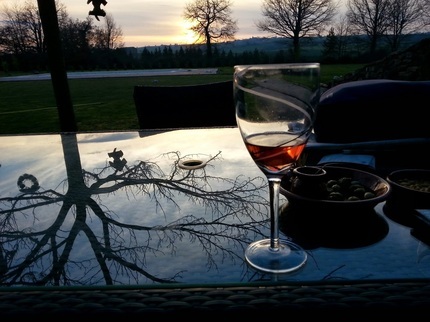 We enjoyed our apéritifs in the garden, watching the sun setting beyond the hills. Food was first class: local produce, fine dining, beautifully served. We chose to have lunch most of the time in the nearby villages and a light supper at le Nichoir. It was not always a good choice: the dinners we had at le Nichoir were far better than local restaurants. Last but not least, our hosts Noella and Simon have succeeded in creating an atmosphere where we felt welcome and at ease, with privacy and presence well balanced. We could feel that they love this place, and so did we. We are frequent travellers especially in France. Le Nichoir will stay on top of our list for a long time. A really lovely and relaxing stay - what a brilliant place for a wedding anniversary! Even the weather was outstanding. You are such welcoming hosts, even Oska and Snufkin. Surrounding countryside and Albi were also outstanding. Thank you. Une belle vacances tranquilles et reposantes - avec une cuisine délicieuse et très confortable. Thank you both for your friendship and for sharing your beautiful home. This is our first visit to the Tarn – stunning scenery and great weather. We had a remarkable meal in the restaurant at Ambialet. We must also mention the delicious meals chez Simon and Noella at Nichoir.